Broken up for scrap in 1928 by Wards at Inverkeithing, Scotland. Propulsion: One 1,350ihp steam engine, one shaft. 77k This photo may have been taken during her inspection by the Third Naval District on 5 September 1918. One of her 3"/50 guns is visible on the bow. Dictionary of American Naval Fighting Ships: Cargo ship Robert M. Thompson (Id. 3319) was built in 1912 by the Great Lakes Engineering Works, Ecorse, Mich.; was taken over by the Navy from the U.S. Shipping Board on a bareship basis 30 August 1918; commissioned that same day; and was assigned to the Naval Overseas Transportation Service, Lt. Comdr. Erik Mattson, USNRF, in command. 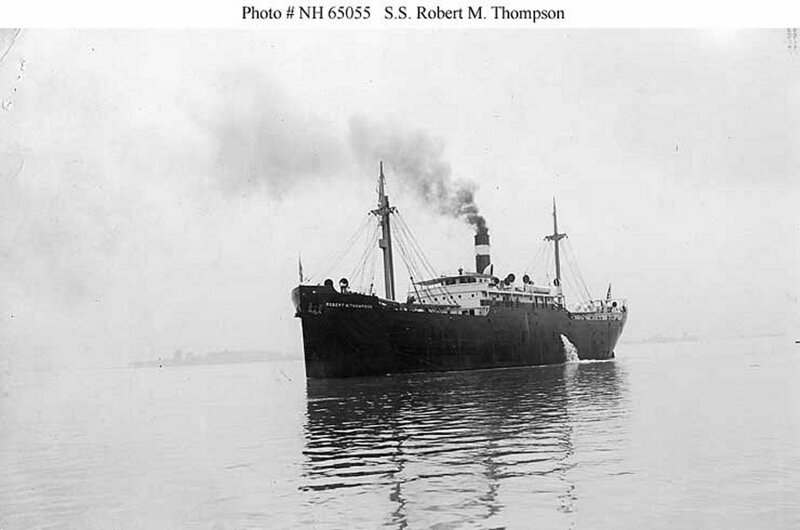 Refitted and refurnished, Robert M. Thompson sailed from New York on 18 September 1918 for Norfolk to load a cargo of ammunition. She departed Norfolk on 23 September and joined a convoy at Halifax. She departed Halifax for Europe on 5 October, but was unable to maintain sufficient speed, and left the convoy to return to Halifax for repairs. On 8 October Robert M. Thompson sailed from Sydney, Nova Scotia, for Bordeaux. She again had to leave the convoy and proceeded independently to Gibraltar, arriving at the strait on 23 October. She again attempted to reach Bordeaux 31 October, but was forced to return to Gibraltar by engine trouble. After repairs, she sailed 9 November 1918 and made calls at Verdon and Nantes, France, where she unloaded her cargo. She sailed from the latter port with Army return cargo on 3 December and arrived New York on 2 January 1919. 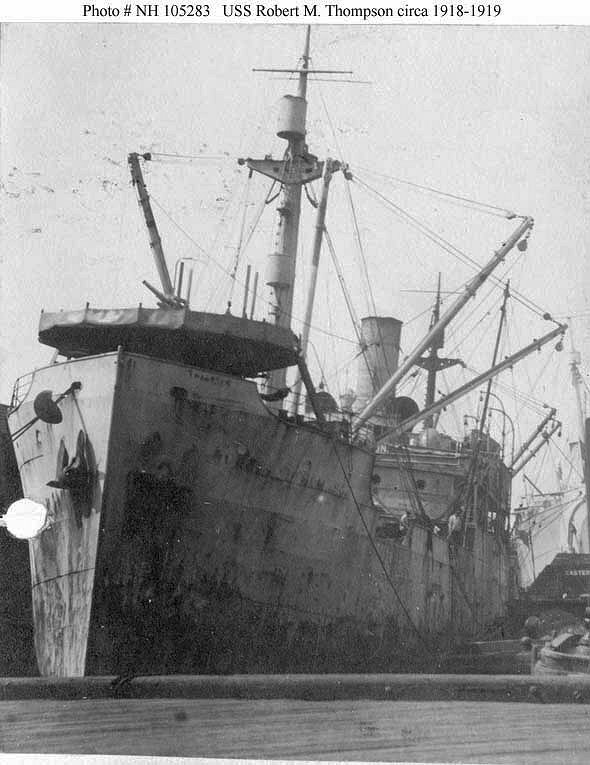 Robert M. Thompson remained at New York until she was placed out of commission there 14 February 1919 and returned to the Shipping Board for simultaneous return to her owner, American Transportation Co.